India Set Top Box market shipments volume reached 4.20 Million units in CY Q4 2013, a marginal decline of 0.31% to the previous quarter. SKYWORTH emerged as the new market leader. Domestic production exhibited a substantial increase of 159%. Total Shipments for Set Top Boxes (STBs) in India amounted to 4.20 Million units in CY Q4 2013; representing a marginal decline of 0.31% to the previous quarter; SKYWORTH emerged as the new market leader followed by TECHNICOLOR and CISCO. In CY Q4 2013, the DVB-S type of STBs held more than 51% of the total market share followed by DVB-C. Further, SKYWORTH, TECHNICOLOR and CISCO together aggregate 63% of the total market share in terms of the total Unit Shipments in the India STB market. SKYWORTH experienced a significant increase of 92% replacing TECHNICOLOR and emerging as the new market leader as compared to CY Q3 2013. Source: 6Wresearch Quarterly India Set Top Box Market, CY Q4 2013. Note: Others include Terrestrial, IPTV, Hybrid, and Android type of Set Top Boxes. More than 40 vendors shipped STBs. With regards to domestic production, CY Q4 2013 exhibited an increase of 159% as opposed to CY Q3 2013. 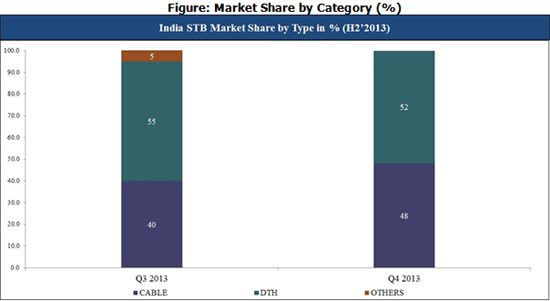 SD (Standard Definition) STB leads the Indian market having 67% of the total market share. In CY Q4 2013, MPEG-4 featured STBs registered 53% of the total market share, representing a decrease of 8% in terms of the total unit shipments as compared to previous quarter. Rising demand for HD channels resulted in an increase in the number of total unit shipments for HD (High Definition) STBs in CY Q4 2013 as compared to the previous quarter. Additionally, in the current quarter, the Indian STB market witnessed a shift in demand towards recording featured STBs, particularly STBs having USB-recording feature. This trend has fuelled the growth of the recording segment in the Indian STB market. Skyworth emerged as the market leader in the Indian Set Top Box market.